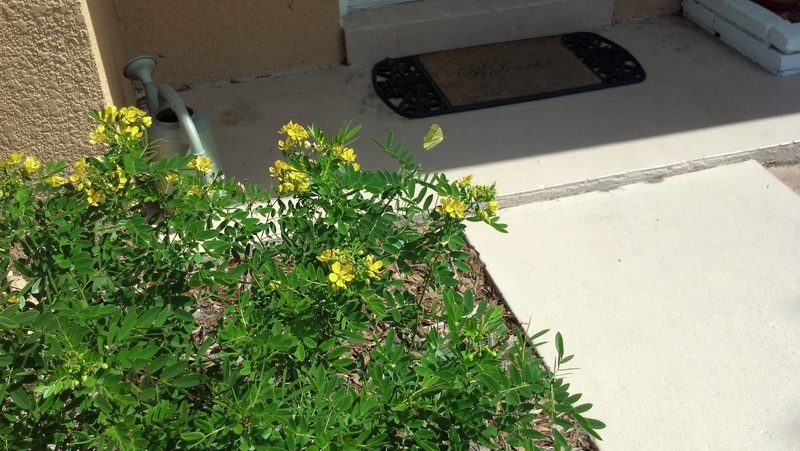 This cloudless sulfur butterfly was SOOOO happy to hang around the Bahama cassia. Oops! Wrong plant, wrong place. This hibiscus is partially rotten. It looks much better since being next to the mulch pile, but it’s too close to the gate and has to go. I will be planting a native elderberry for medicine and yummy treats in the same vicinity, but not so close to the gate. 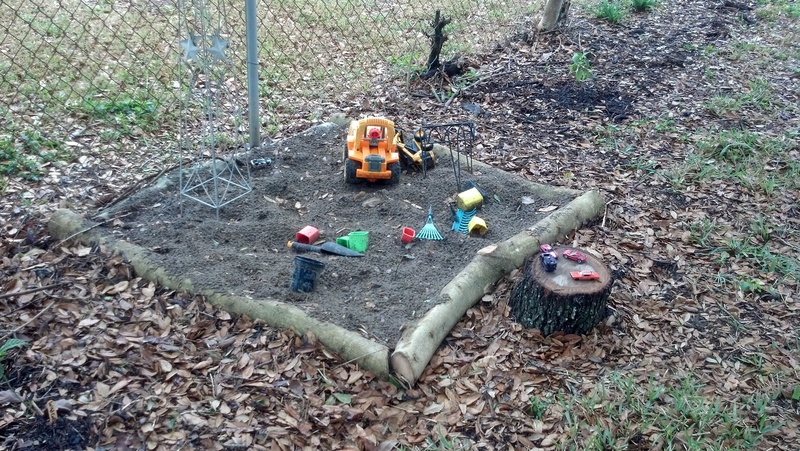 New and improved natural sandbox with scraps from the city brush site. Yard looks and smells amazing today because of the rain. They are ripe when they fall to the ground. Cherry tomato is doing fab. 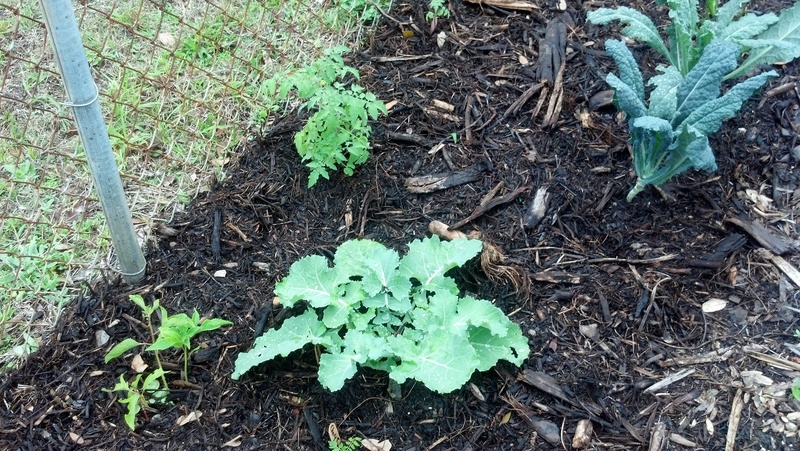 Georgia collards are happy. 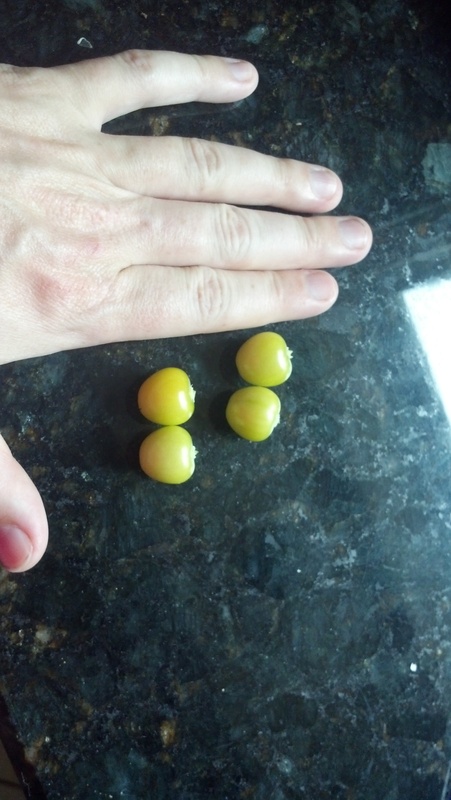 Maypop on the left, lactino kale on right, another cherry tomato in back. 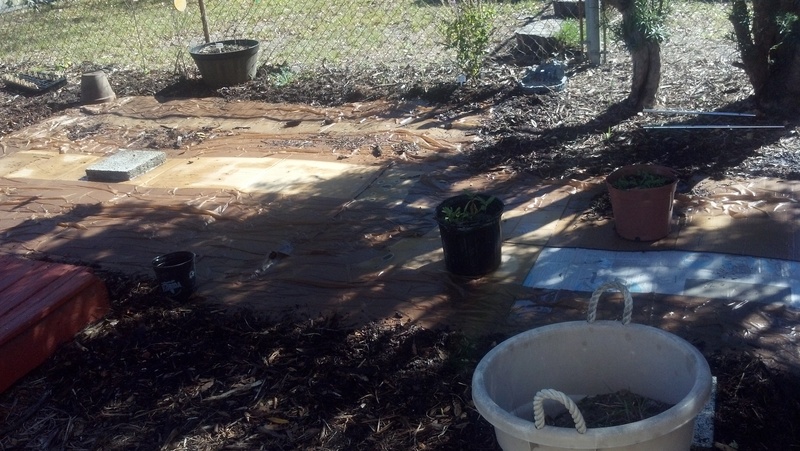 I got the bug to sheet mulch around my side door and shed. 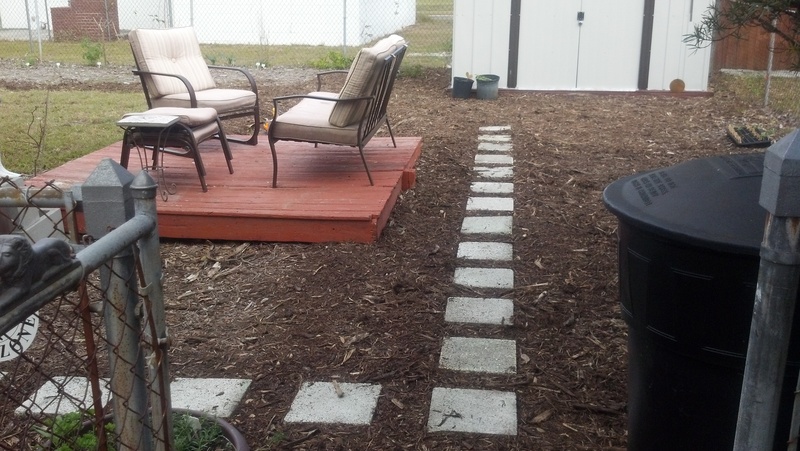 I want to remove the stupid “deck” and put in a rain barrel and make a nicer seating area. I would also like to get a picnic table for outdoor dining and crafting. 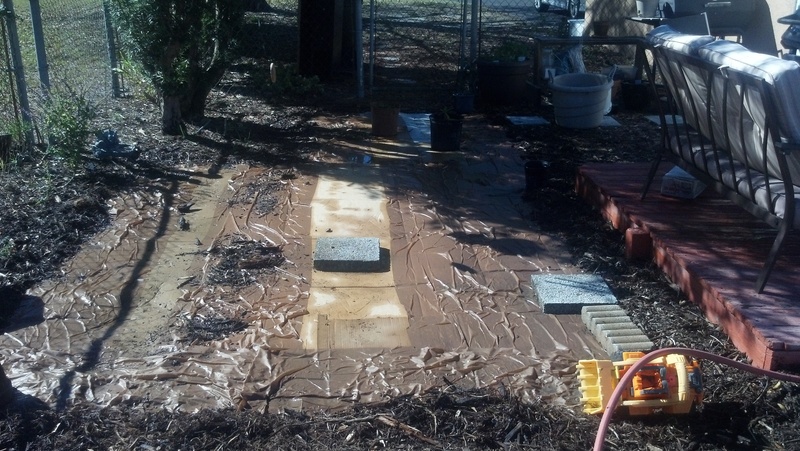 Here are pics of cardboard and packing paper laid out on the ground before applying mulch. I wetted the paper/cardboard down to prevent it from flying away. Potted plants, pavers, and kid’s toys work well for holding down the cardboard. I also like to have a wheelbarrow of mulch handy for throwing handfuls on the cardboard to keep it in place. 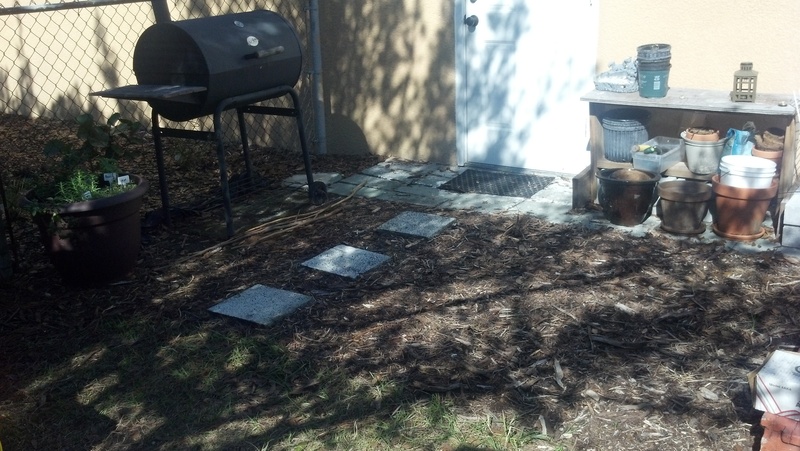 Here are after pics of the same area after adding pavers and mulch. One more pic. 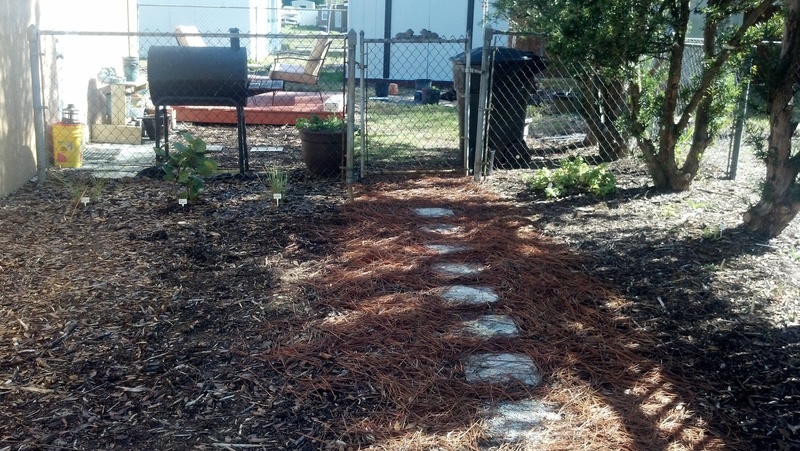 Looks even nicer than this now because I mulched on top with pine needles, they are kinder to bare feet than the chunky recycled mulch and highlight the path. 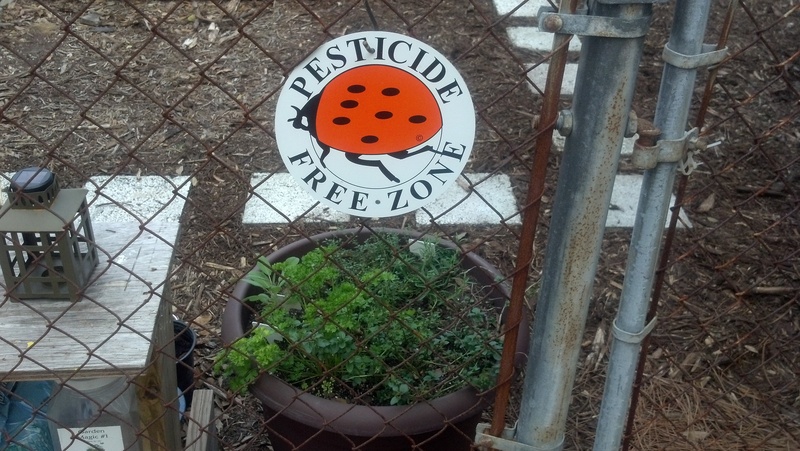 I bought this sign from Beyond Pesticides because I got sick of the cute little frog signs my neighbors have warning that they have poured neurotoxins on their turf lawn. I bought a 72 cell Burpee seed tray. It was no fun trying to get the compressed pellets to expand, I had to help them a lot, it took over an hour. Next time I would throw away the pellets and use sterilized potting soil. I had 22 kinds of seeds I wanted to plant so I planted 18 packets with 4 cells each, and the last 4 were greens. The greens got planted in big pots to make it easier to harvest: right outside my door in zone 1. Melokia (Egyptian) Spinach- seeds I saved myself, yeah! Here is the front entrance. 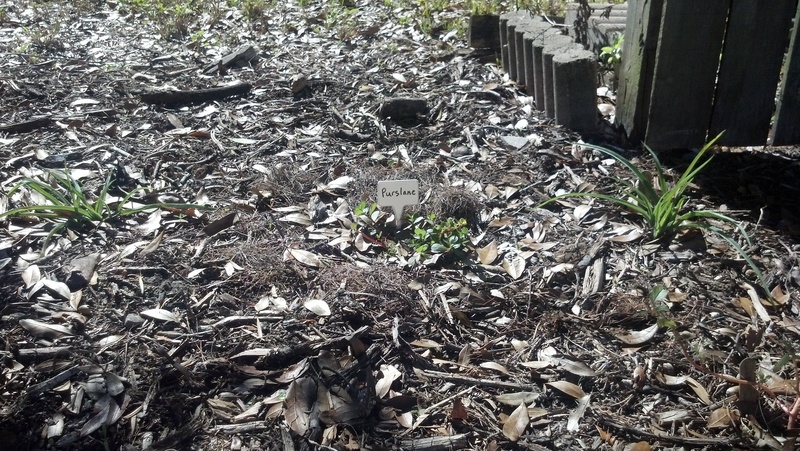 I have removed a small corner of the front yard and made it into a native plant/ butterfly garden. Close up of the plants. 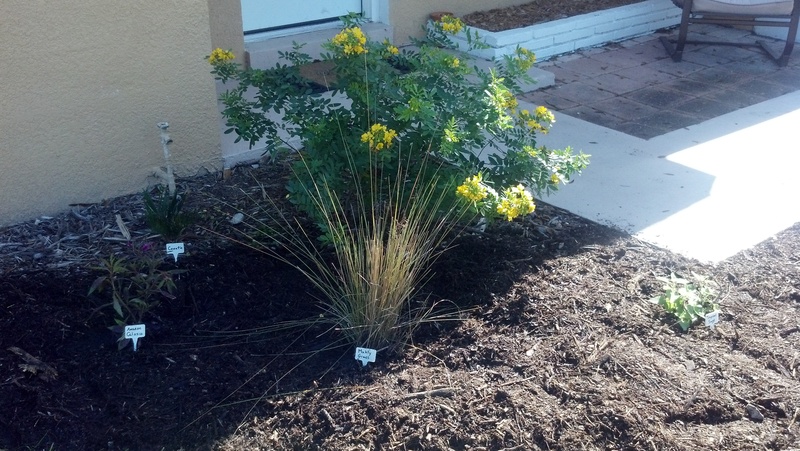 Big yellow is Bahama Cassia, three in the front are (left to right) Amazon Celosia, Muhly Grass, and Tropical Sage. A little Coontie is behind the Celosia. My son loves coonties. I plan on trying to grow some Pansies from seed in the front, don’t know if they will grow in Florida though. The Cassia is awesome. In just 6 months it’s gotten huge. We had several cloudless sulfur caterpillars on in but I haven’t seen any cocoons. 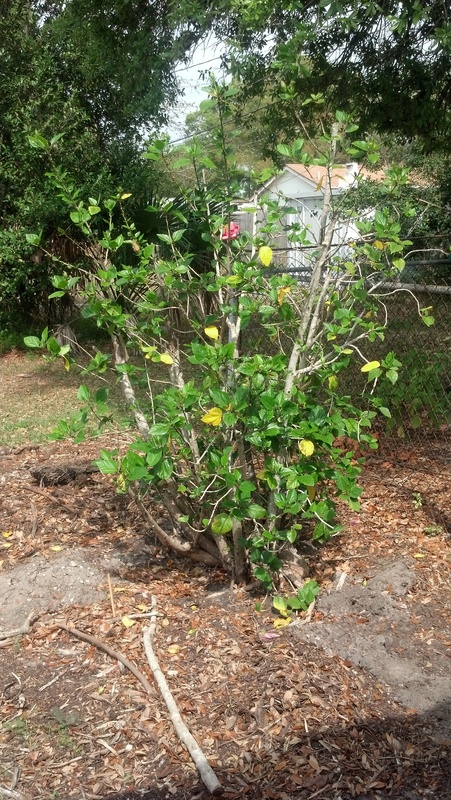 I’ve trimmed it, chopped and dropped, and the leaves just disintegrate. Here’s a close up of the pretty flowers. To the right of the house, I put in this path. 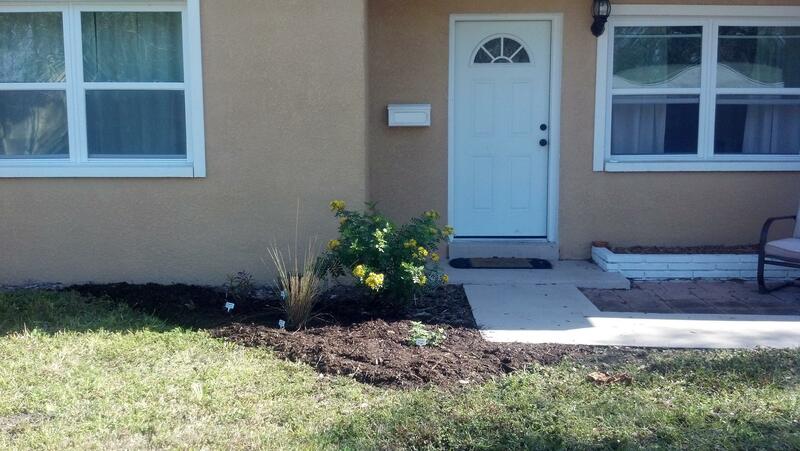 It used to be mostly sand with a few weeds, so I just pulled the weeds and mulched on top. 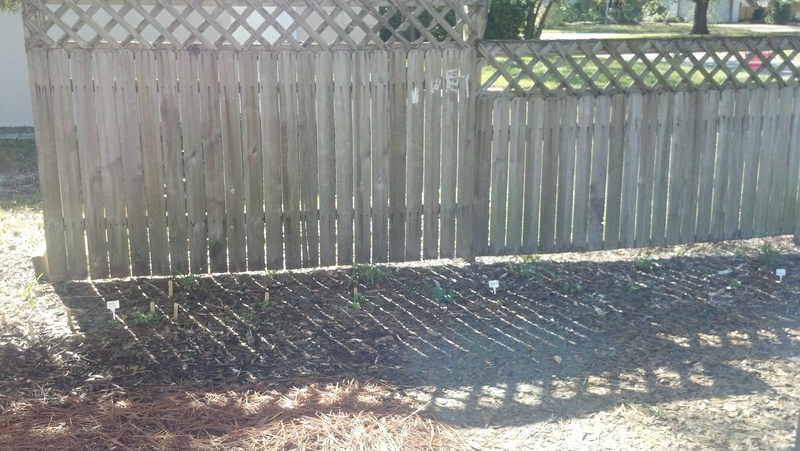 The pine needles were courtesy of my neighbor who is glad to be rid of them. They are softer under bare feet than the scratchy city mulch with it’s wood chips, and I like having a different color mulch for the path. 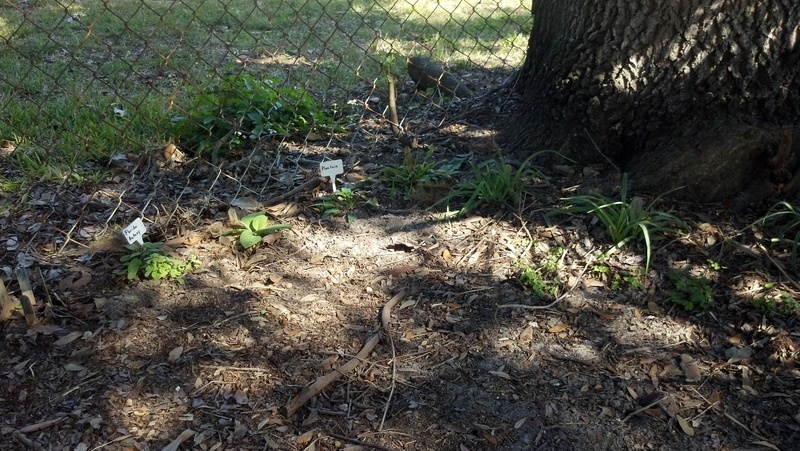 By the sea grape I planted some native grasses and beach sunflower seeds I harvested from someone’s sunflower patch. 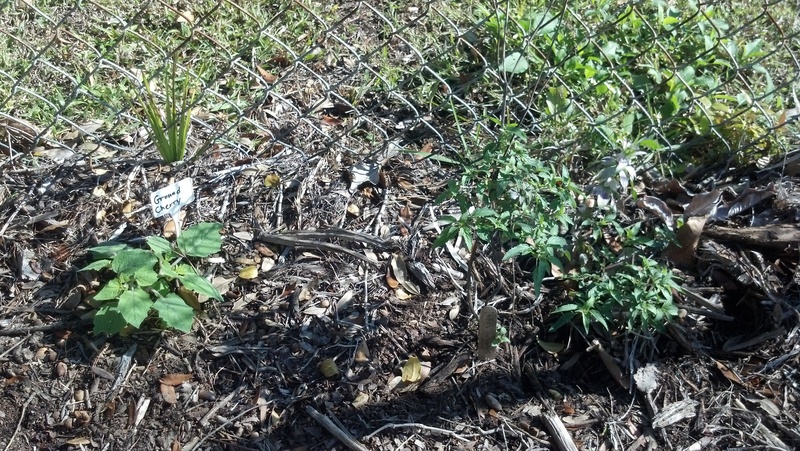 To the right is my survival/ weed/ foraging garden. This is to help my son learn wild plants he can eat or use for medicine. The weed garden has spiderwort, wild violets, beautyberry, purslane, chickweed, sheep sorrel, plantain, wood sorrel, and wood betony. The violet leaves are fun to use in soup because they are heart shaped. 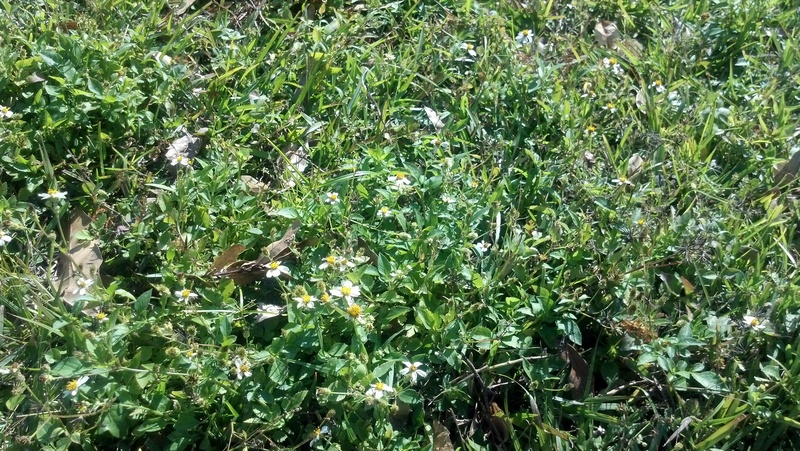 Above: spiderwort and violets. Below: spiderwort and purslane. 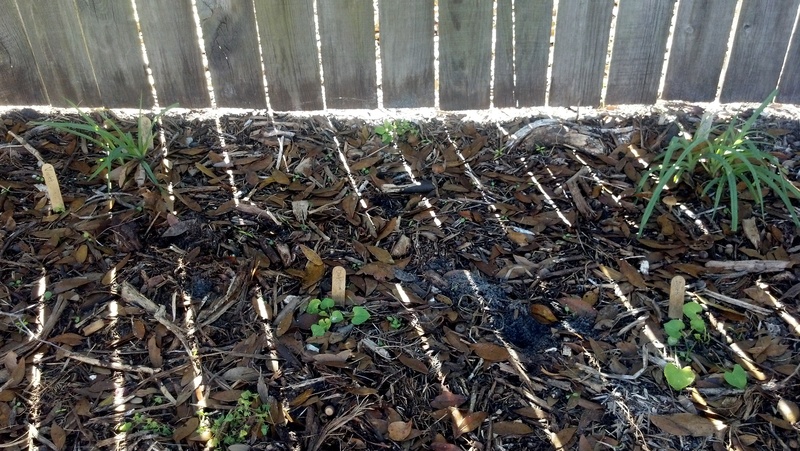 The nearby oak tree provides constant leaf mulch, so I should not have to mulch this area again. 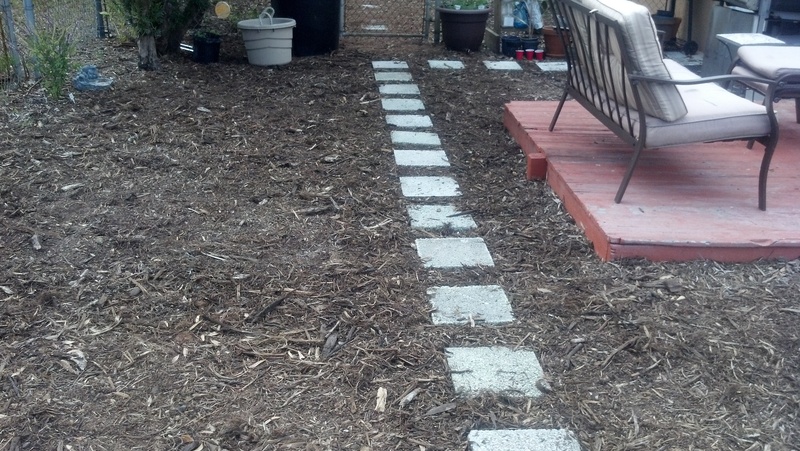 Here is another path I made by the side door, I had to sheet mulch here because the grass was thick. 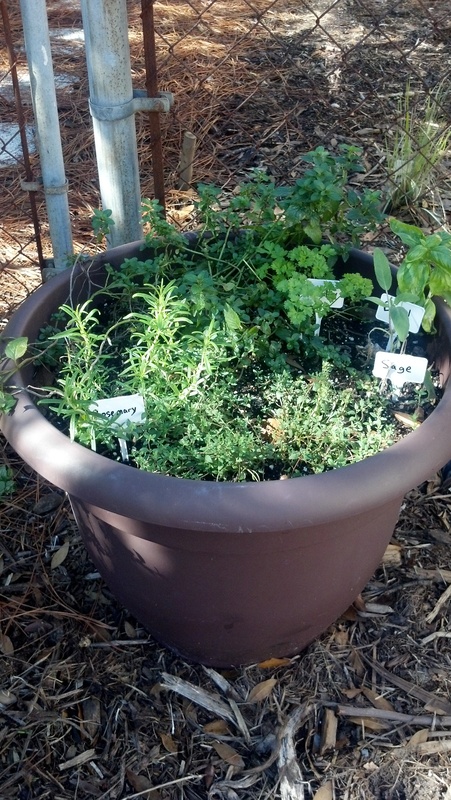 Close up of the herb pot. It holds water well because I drilled holes a few inches from the bottom to keep some water in. 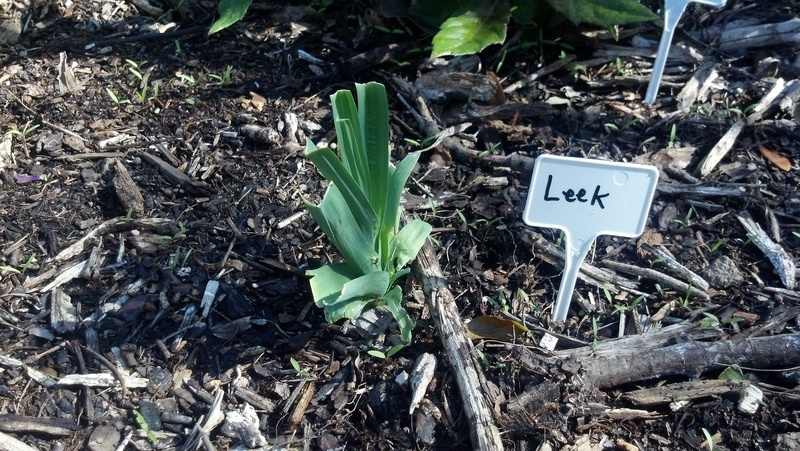 I have these plant labels all over the garden, they are to help my son learn the plants, help me remember what I plant, and also useful for yard tours. 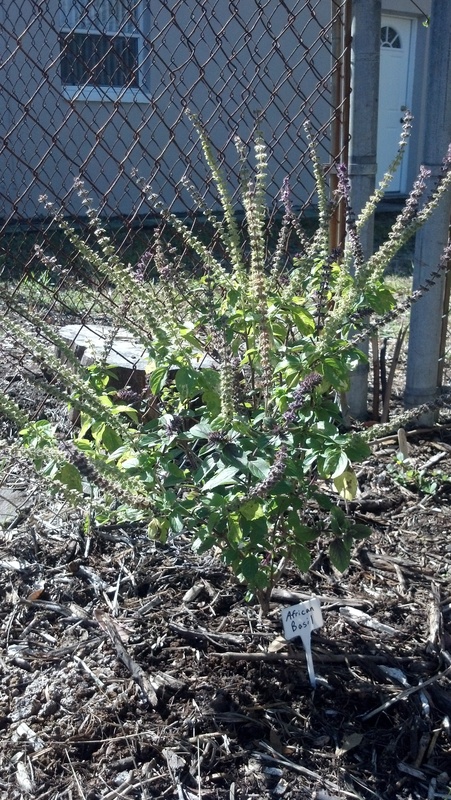 In the back yard, the African Basil is thriving. Pollinators love the purple blossoms, especially wasps. Blackberry looks a little stingy. 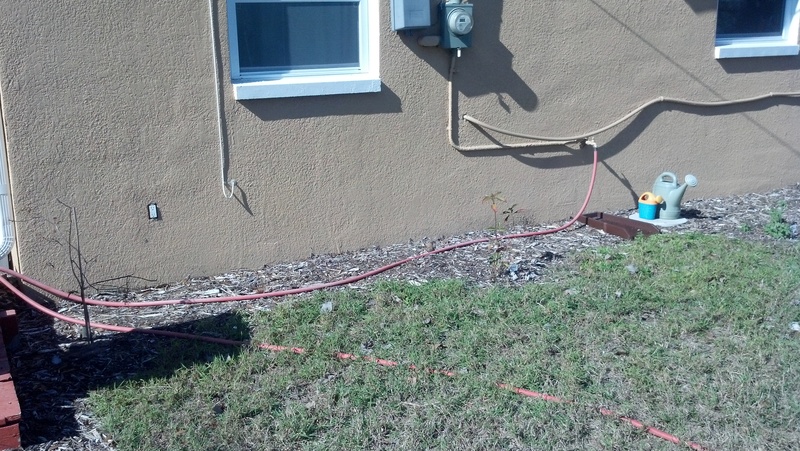 It is espaliered against the chain link fence, with 4 main canes. 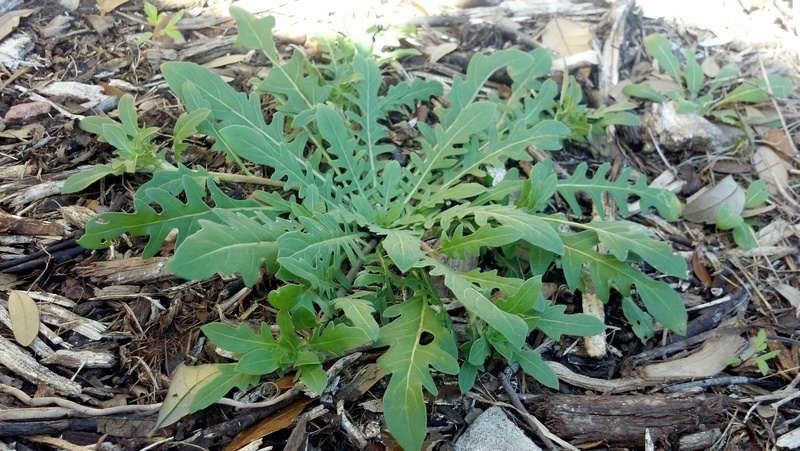 Maybe I should plant it in the ground but I am afraid it will become invasive. 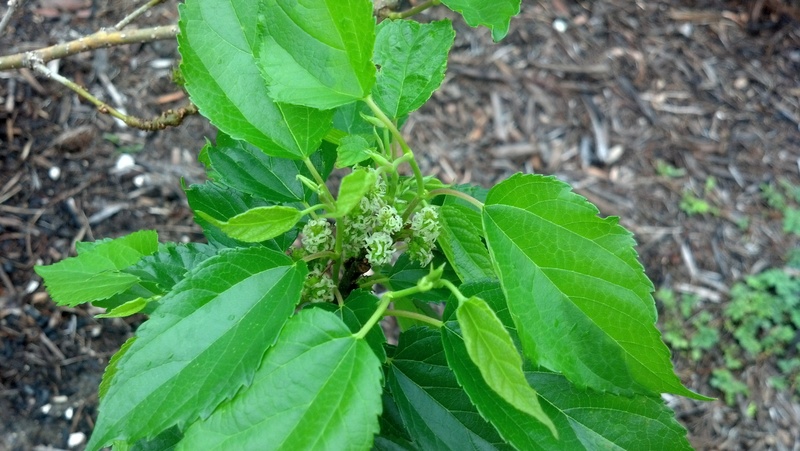 Hopefully we will have berries soon. We have a new shed thanks to my wonderful husband. 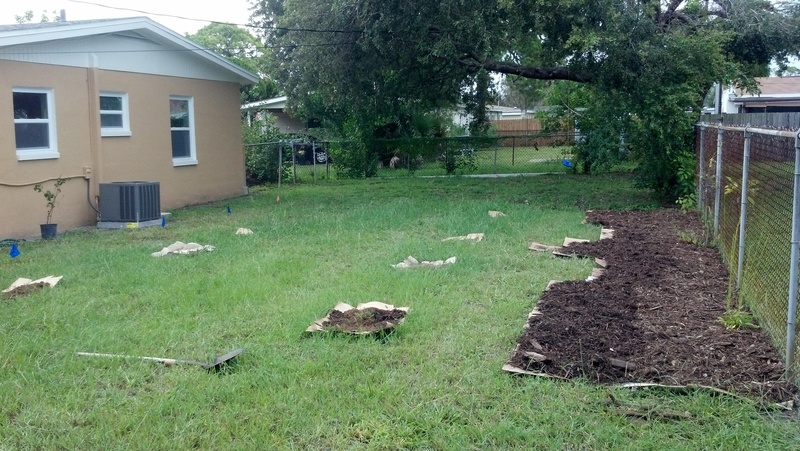 And you can see sheet mulching in progress. I hope to move the outdoor chairs to this spot after mulching, as the existing “deck” is in poor repair and in a spot that does not have good flow. Here are some pics to compare to the “before” pics. 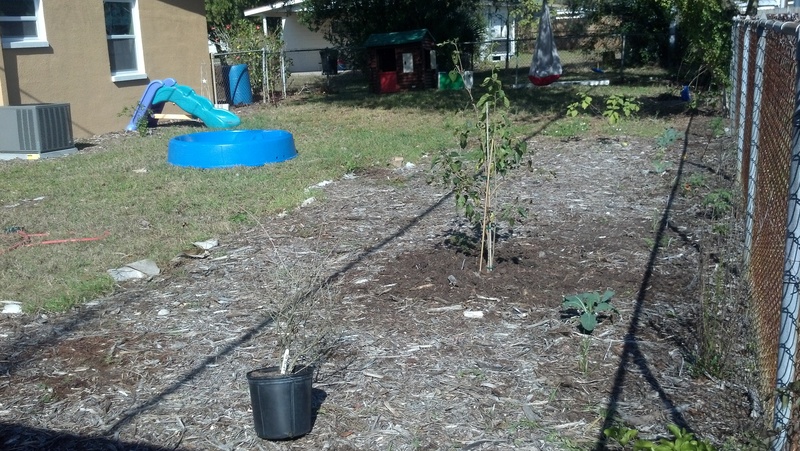 From left: Railroad Vine, Okinawa Spinach, Crossvine behind the spinach, Privet Cassia, Climbing Aster, and Verbena (which should form a groundcover). Okinawa Spinach made a cute orange flower, how unexpected! 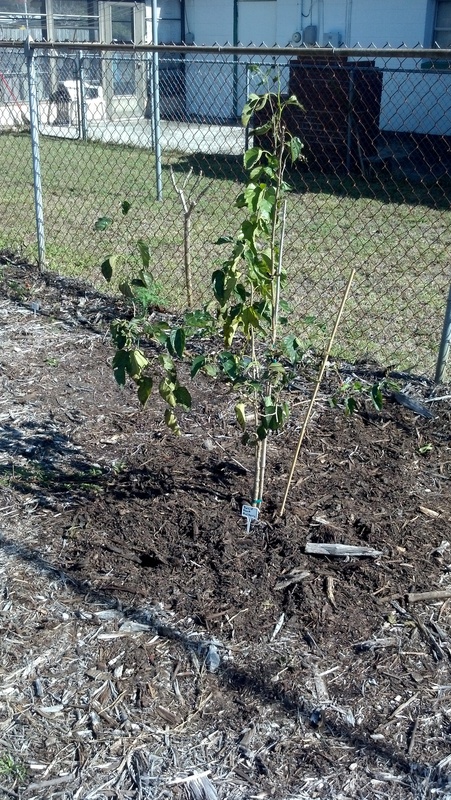 I accidentally planted my dwarf Black Mulberry too close to the fence so I had to transplant it, that’s why it looks a little limp. This time I planted it the right way, in a large hole filled with compost. 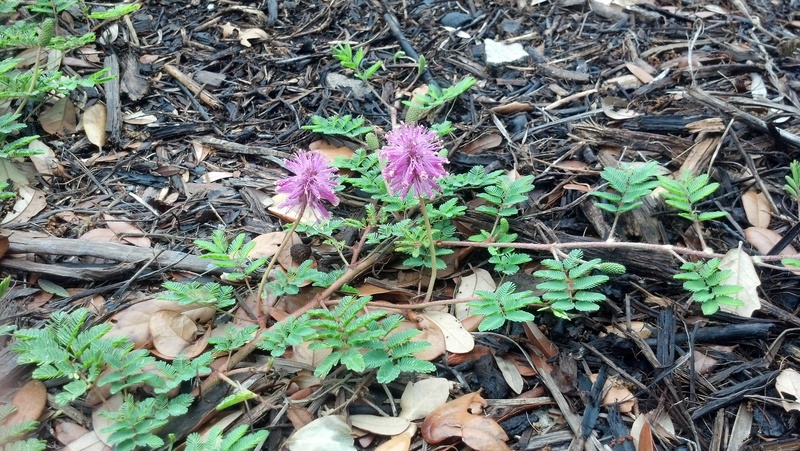 I planted a sunshine mimosa runner close by to give it some nitrogen. 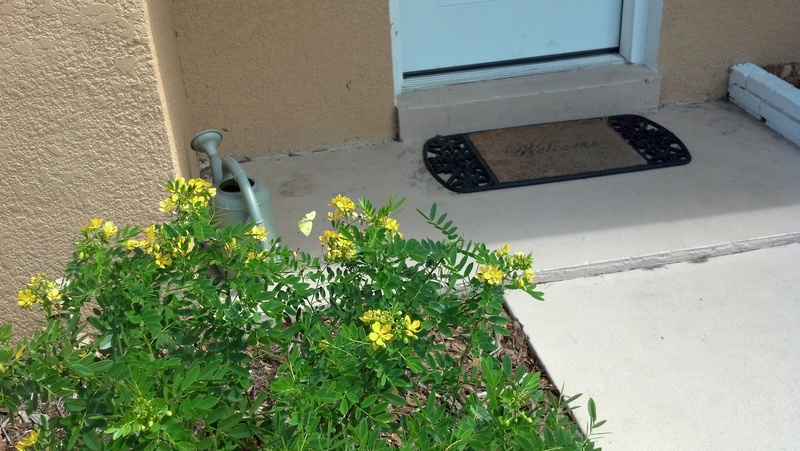 A few months ago it looked dead and the leaves were deformed, and a tiny mimosa nearby brought it back to life. 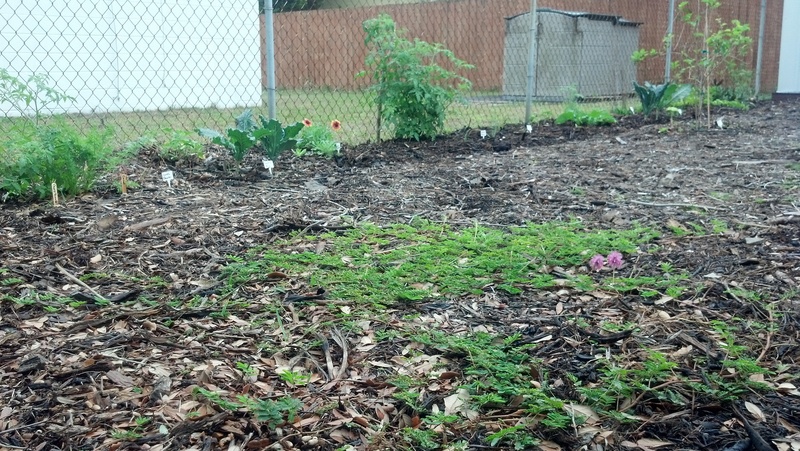 I planted veggies from seed to save money. Cucumbers did ok, I got about 15 from 3 vines, and then they were attacked by mealy worms. 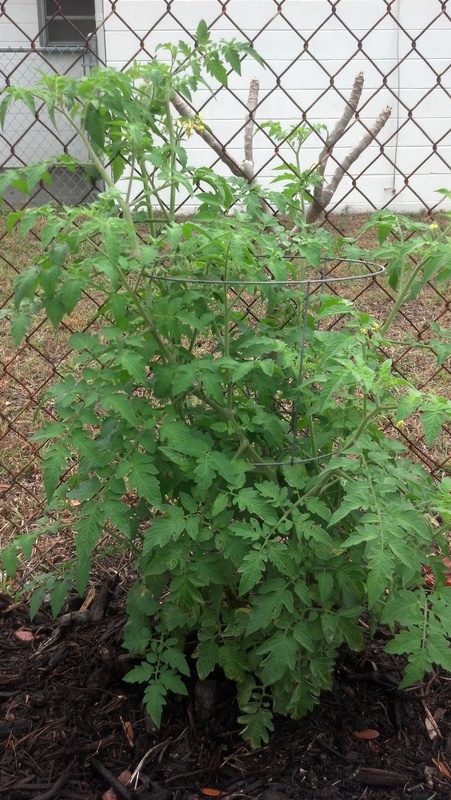 I also have Cherry Tomatoes, Carrots, Ground Cherry, (all from seed) and some Florida Wild Onions and Softneck Garlic. 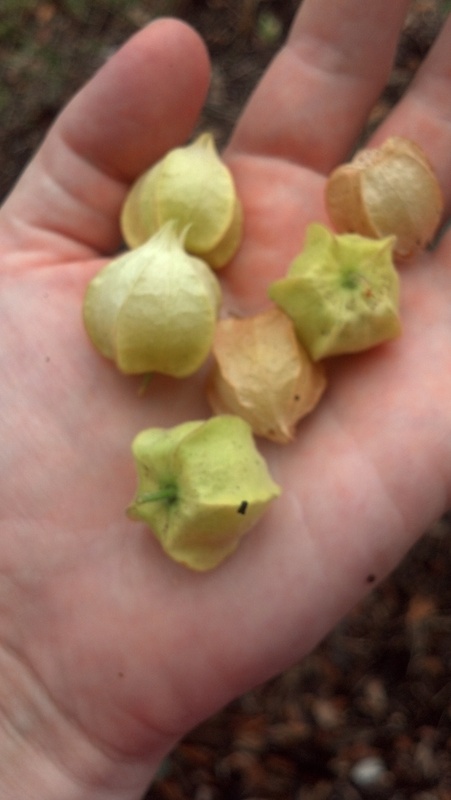 Tomatillo seeds didn’t germinate. 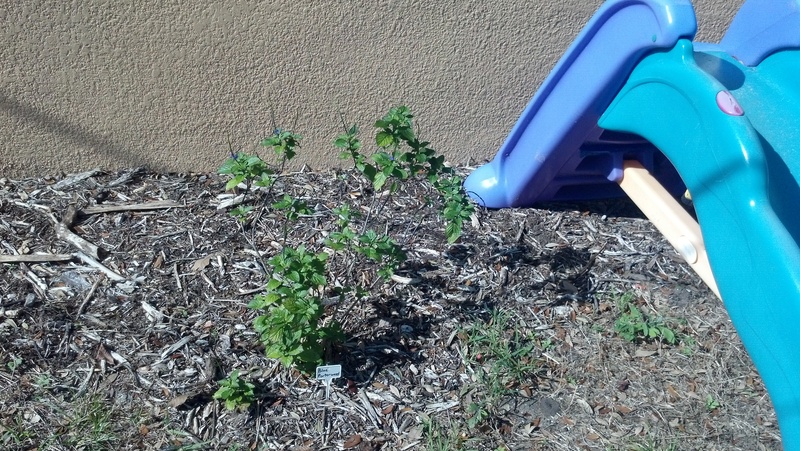 Here is some Kale from seed, it’s doing awesome, and a Beautyberry in full sun. 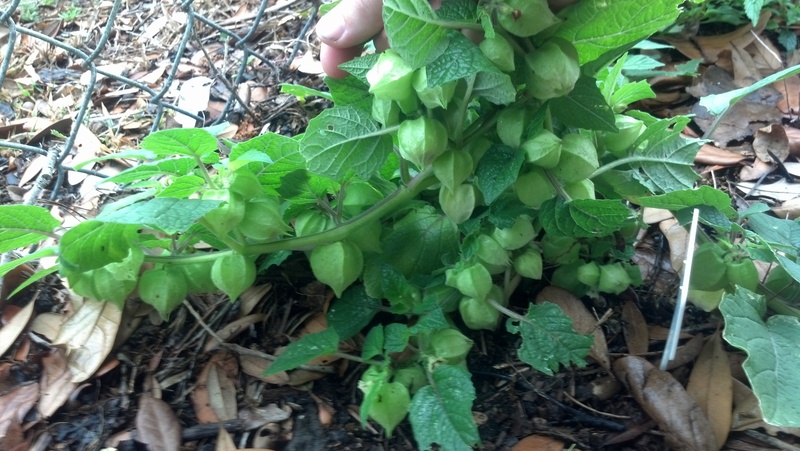 Here is what I hope is Ground Cherry (I haven’t grown it before) and some Dotted Horsemint. I refuse to buy a weedwacker so I mulched a foot out all the way around the house. I didn’t want to be haunted by Torpedo grass so I weeded it all by hand. 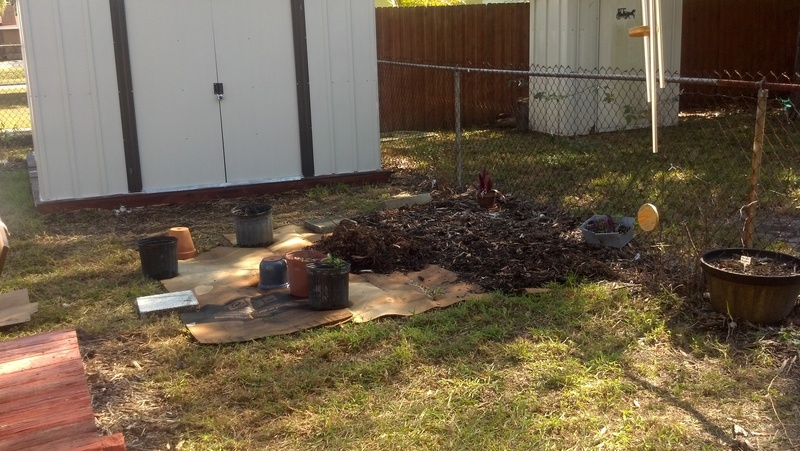 I didn’t want to waste my cardboard to enrich the soil here, and I only put down 2 inches of mulch. 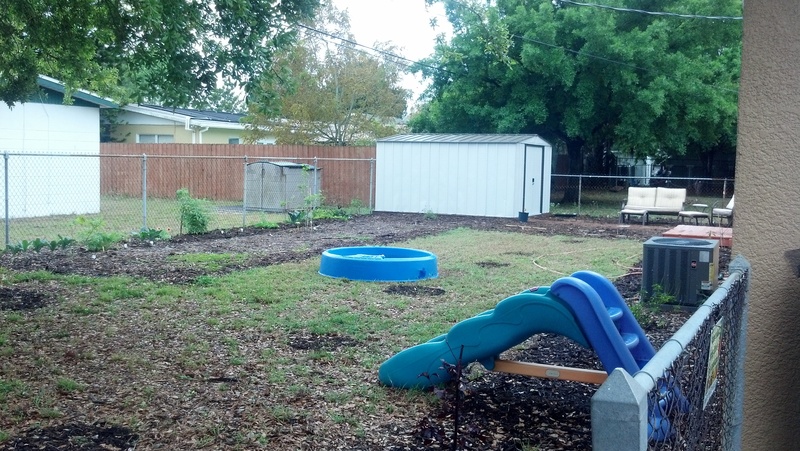 The extension office says 2 inches of mulch won’t attract termites. There are two Firebushes here but the one on the left looks dead. I think it got too much water since it was planted near the hose nozzle. I moved it a month ago and it’s still unhappy. I was hoping they would grow big and shade the house. I don’t plant edibles/ medicinals near the house since it was built in the 60’s when they used to use lead paint. Can you help me solve the mystery? I don’t know what this weed is, but it looked neat. Here is the natural playground. 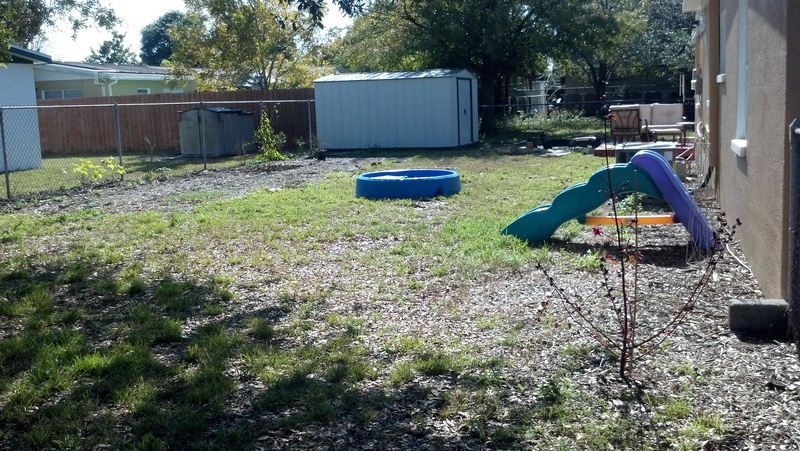 At the right is a sand pile that will look more like a sandbox when I get some logs to frame it. 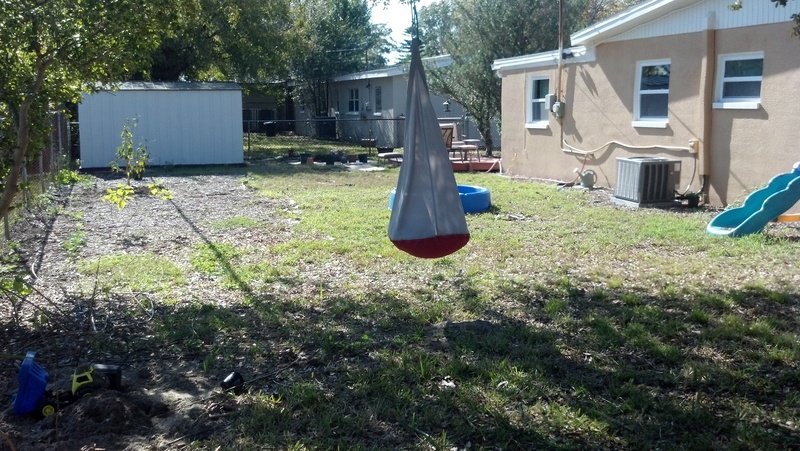 The swings are great for kids with sensory issues. The hammock swing (hard to see) can swing side to side, back and fort and spin. We used to do this when my son went for occupational therapy. For $10 I have a nice hammock and we can do “therapy” at home for free. 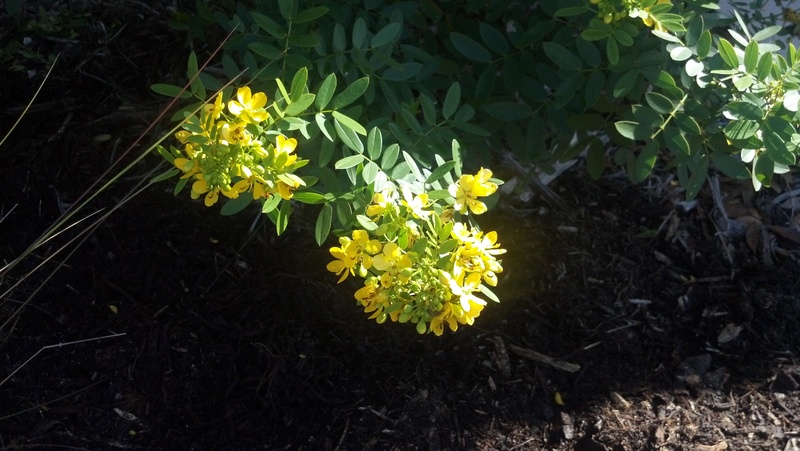 Sunshine Mimosa is spreading well over the mulch. It looks like it will be a slow process. I don’t think it especially likes to have to grow over sheet mulching but eventually the cardboard underneath will break down. 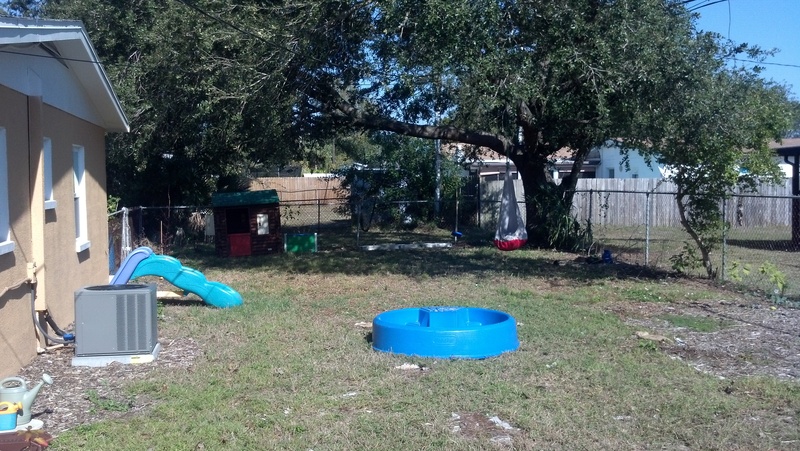 I can’t wait until the whole back yard is sheet mulched and covered in mimosa. Goodbye sandspurs and mowing!! 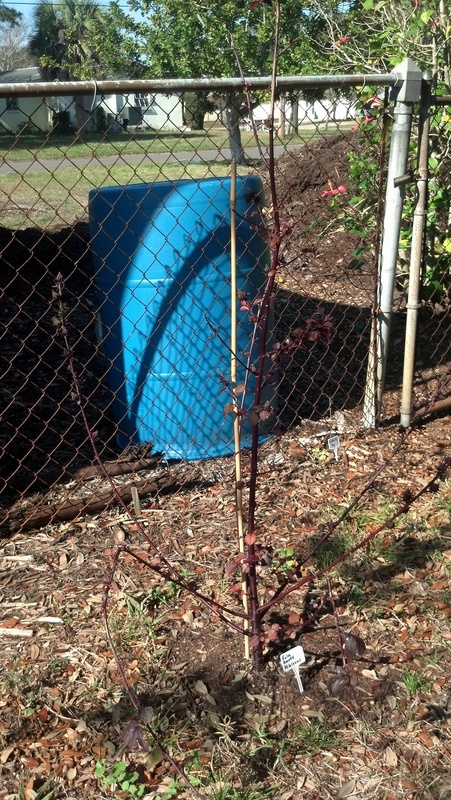 I had to move the Cranberry Hibiscus/ False Roselle when we built the shed. It lost all its leaves but they are coming back. I originally planted it too close to the fence, not knowing it would get this big. It was 12 inches tall when I got it 4 months ago! 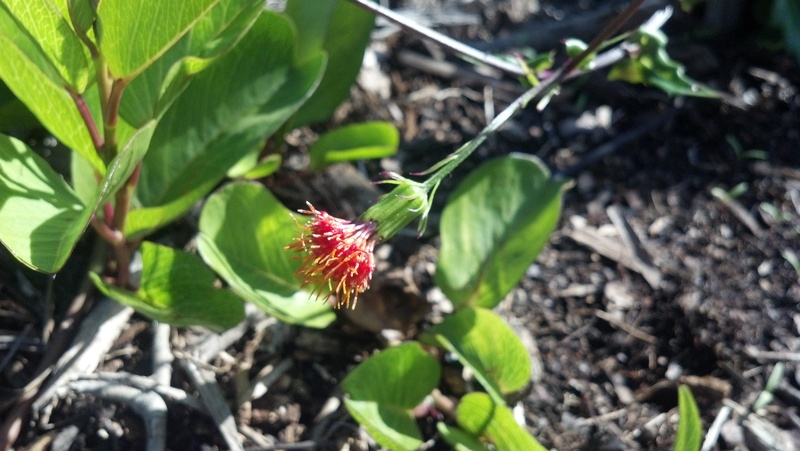 This is one of my son’s favorite plants to pick and eat, they taste sour like sorrel. I think it needs to be pruned. In the very back corner is my zone 4: “A semi-wild area. 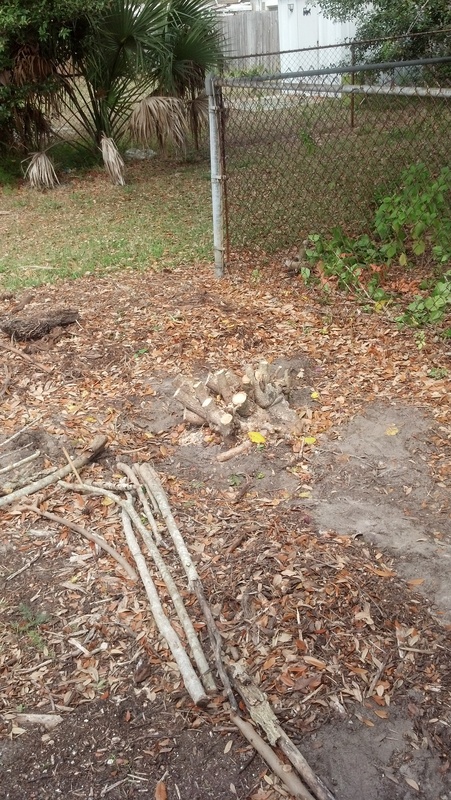 This zone is mainly used for forage and collecting wild food as well as production of timber for construction or firewood.” I am only using natural mulch from the oak tree, planting weeds and pulling grass (grass doesn’t like to grow under the oak anyways). 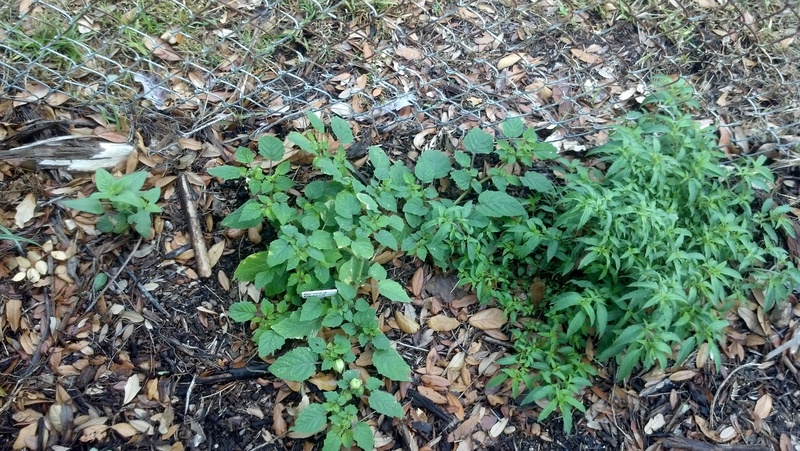 Shown here is Florida Betony, Comfrey, Broadleaf Plaintain, Sheep Sorrel, Spiderwort, and Wood Sorrel. The comfrey needs to be squished by other plants and in shade to survive. 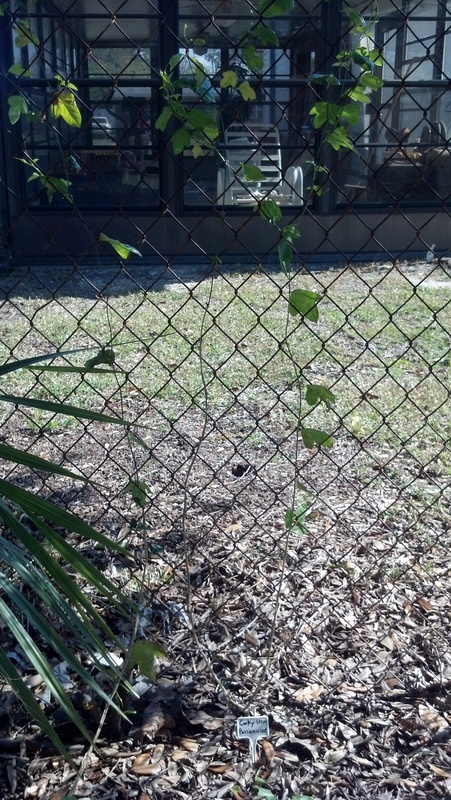 There are native Corkystem Passionvines growing all over the yard and the chain link fence. 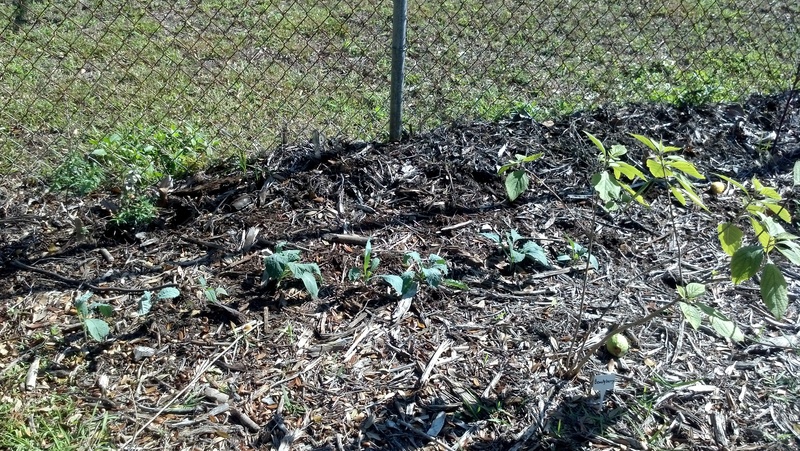 I am digging up the ones in the middle on the yard and replanting by the fence. Seems a waste for them to get mowed. We have a few gulf frutillary butterflies and I have seen some eggs too. Hooray for free plants! Here is where the old mulch pile was. The ground underneath is beautiful dark rich soil. 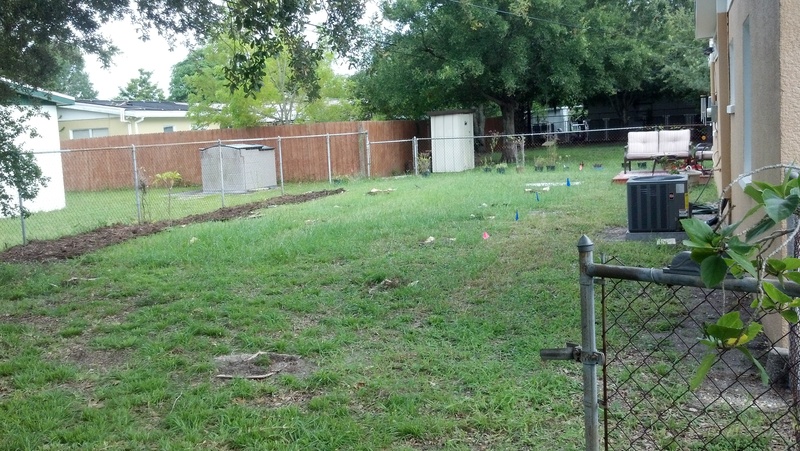 I weeded around the pile and now have a big grass free patch with barely any work. 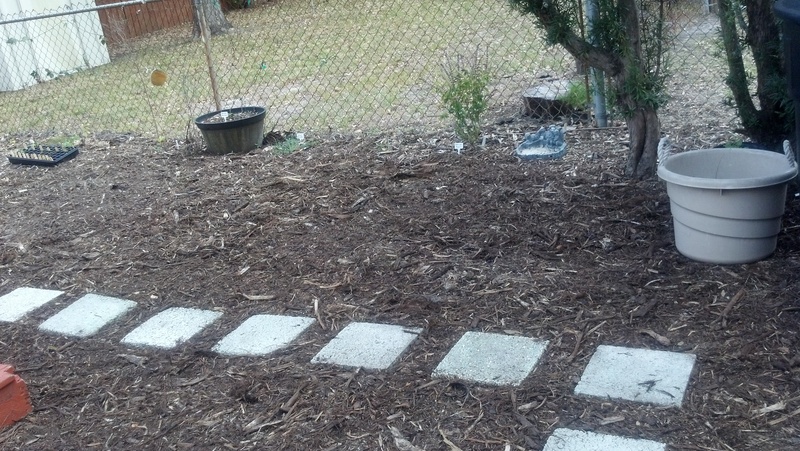 I plan on planting sweet potatoes here, along with purple alyssum and dill as companion plants. 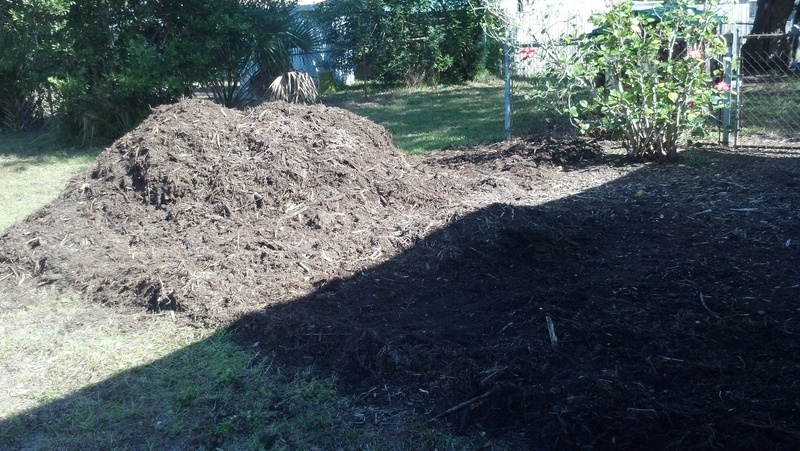 I had a new mulch pile delivered so it could start composting. I placed it to the left of the old pile so they could touch and the mushroom and fungi spores from the old pile could transfer to the new, and tossed a few handfuls into the new pile. My son helped and he really enjoys climbing the mulch mountain. It’s part of the natural playground until it gets used up. The city mulch is WONDERFUL stuff. 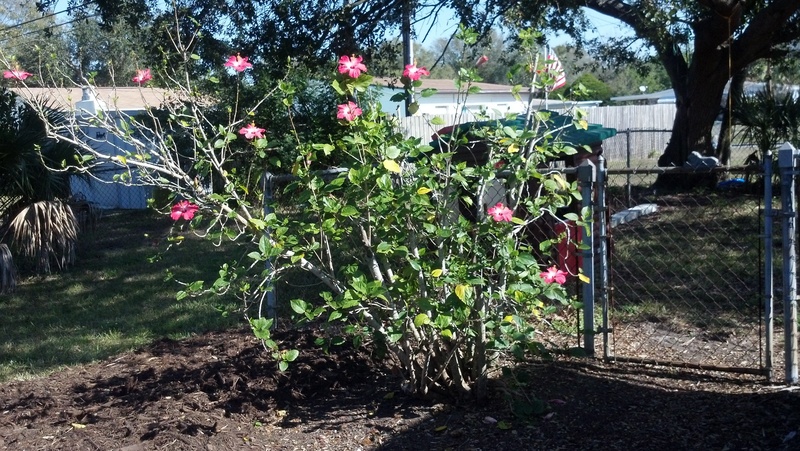 This Hibiscus tree (which I plan on replacing eventually) was almost dead when we moved in, and now it’s bursting with life just from being near the mulch pile. 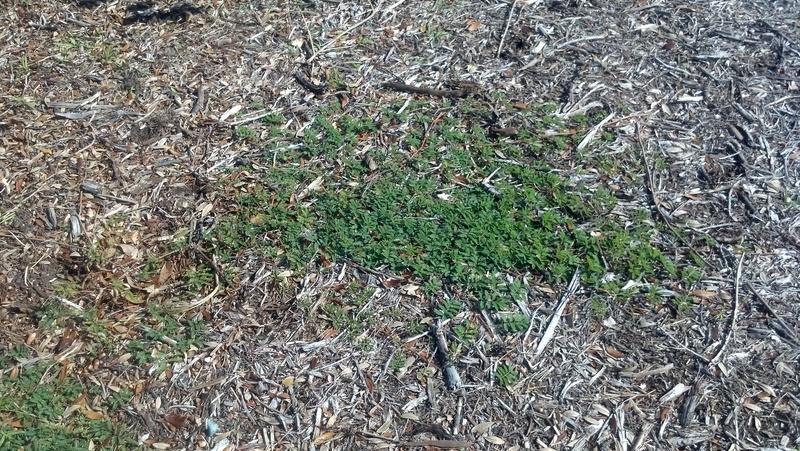 Obviously the nutrients and water storage in the mulch were helping it. 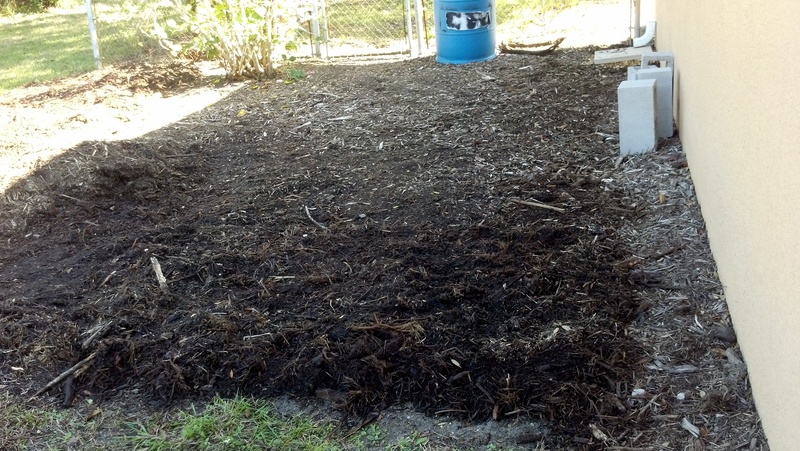 Mulch is the easy way to build up good soil. And what about the front yard? 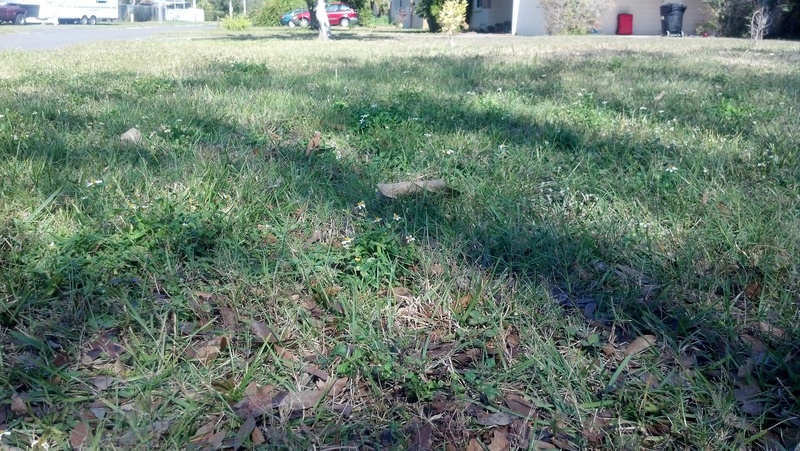 Well, it doesn’t need to be mowed in the winter. And it’s full of food (Wood Sorrel and Spanish Needles), medicine (Spanish Needles), and Fogfruit/ Matchstick for the butterflies. 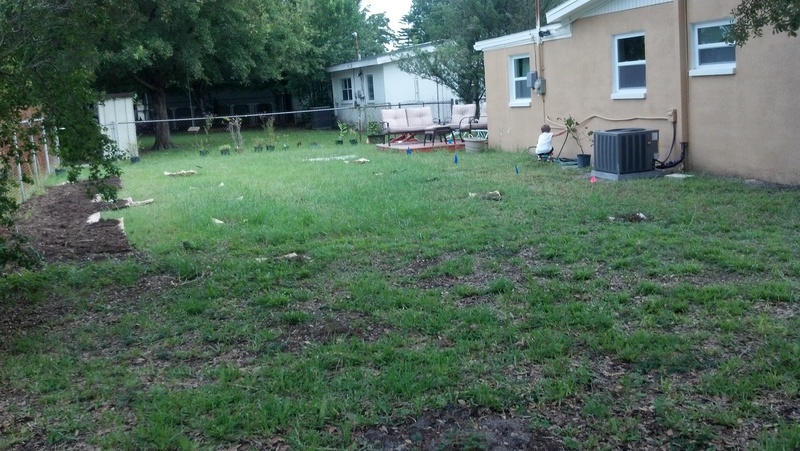 And it still looks like a relatively inconspicuous yard from the front (except for the giant mulch pile on the side). I am starting to make friends with the local Muscovy ducks who come here to eat bugs and provide fertilizer for us. Bees love the spanish needles. The little one likes to pick the petals and eat them. I believe I would be able to grow all these plants at my home in zone 9B. I hope to obtain them and try them out soon. Here is 4 days of progress on killing the grass. I lay down a broken down cardboard box and then use newspapers to fill in the gaps between the flaps of the opened box. Luckily I have an infinite source of recycled cardboard boxes, I have been picking up a small load daily. I now have a wheelbarrow which makes the job way easier. I am aiming for 2-3 inches of mulch on top of the cardboard. 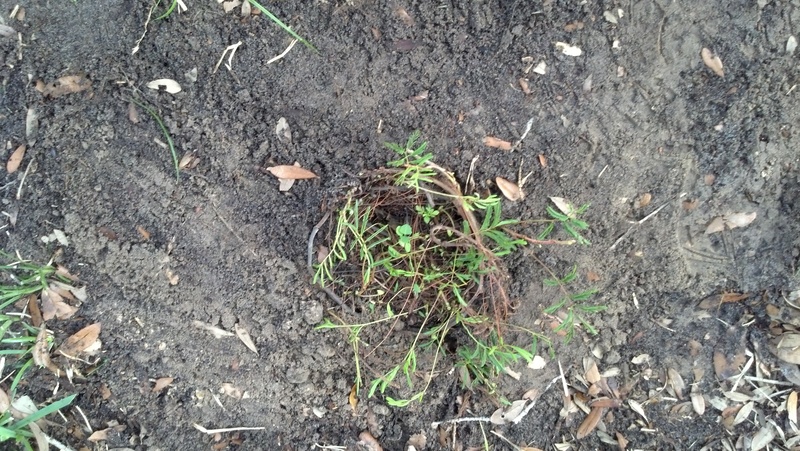 I just finished planting 14 one gallon potted sunshine mimosa plants. These are a native Florida plant and are really fun. The leaves fold up when you touch them, and they have pretty purple flower that attract butterflies. 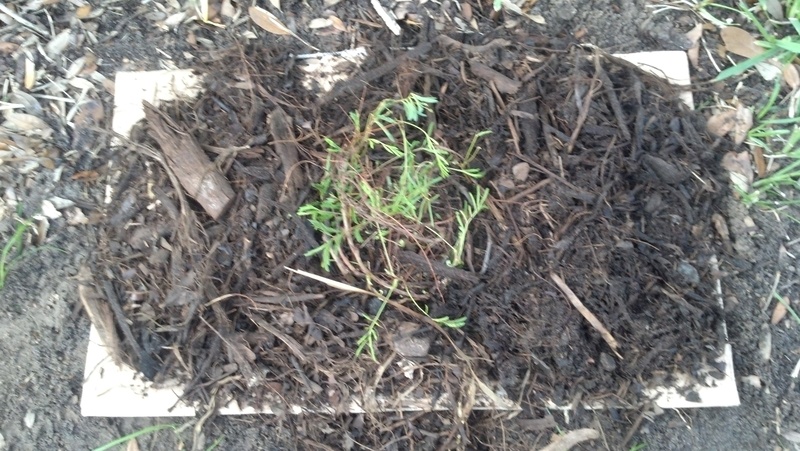 I first dug a hole, weeded around the hole a bit, and then planted the mimosa. 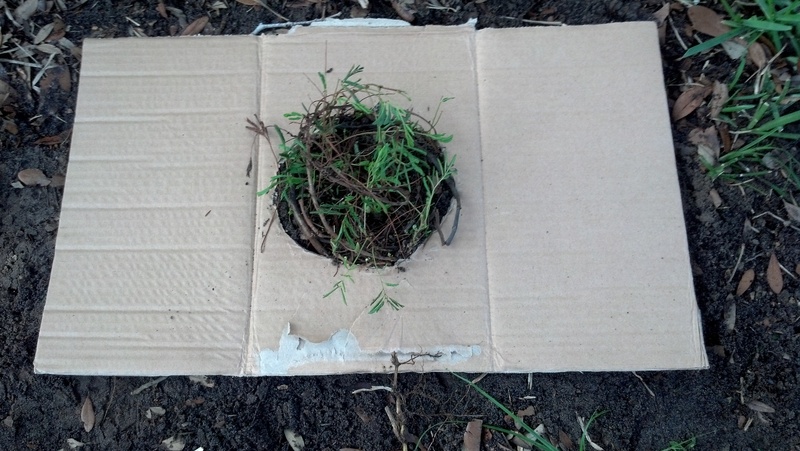 Then I placed a piece of cardboard with a hole cut in the middle around the plant and pulled all the pieces through. Finally I put dirt or mulch around the plant to hold the cardboard down. 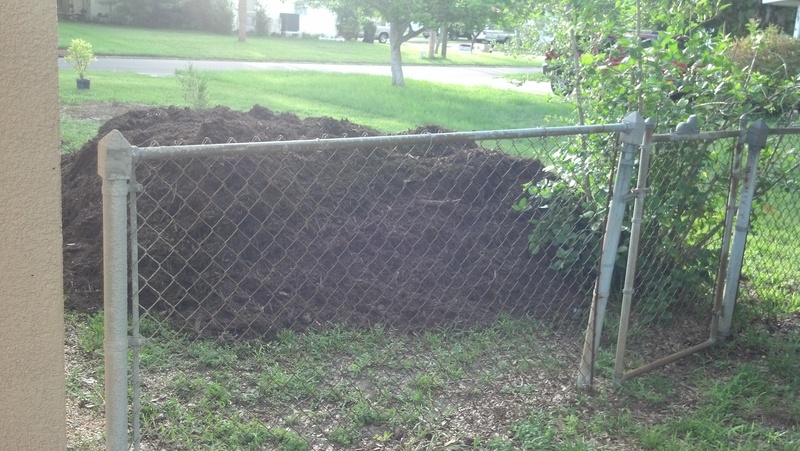 I also got 6 cubic feet of composted mulch free from the city, I had to pay $25 for delivery. It’s hot inside the pile. My son is having fun climbing on it. I’m going to have to buy a wheelbarrow ASAP. I’m collecting cardboard for sheet mulching. 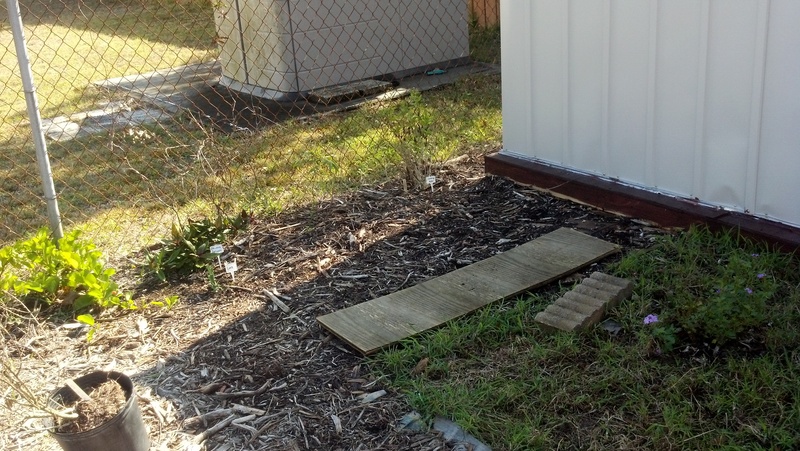 This means putting down a broken down box and then placing mulch on top of it. Now the size of the project is beginning to intimidate me. And it’s the hottest time of the year. Oh well, gotta keep on keeping on. I know it will pay off.